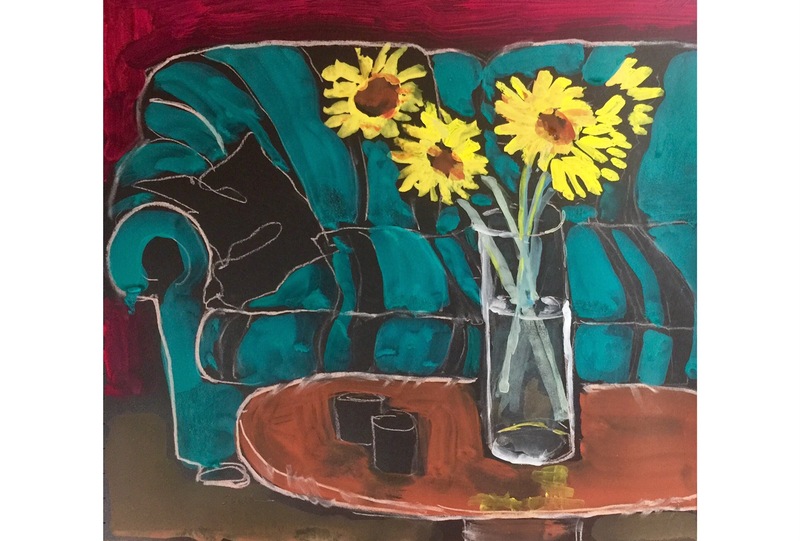 I bought five huge sunflowers and as I sketched began to think of a school counselor I worked with years ago who loves sunflowers more than anyone else I know. At the start of each year she poured her heart into making a schedule for our school. She was one of the few people who could make a schedule that met the needs of children and kept life sane for teachers, her schedules were practically magic. And she kept up a demanding pace for the rest of the year. She ran groups, helped staff, kids and parent solve problems, and was fun to work with besides. So Marci, these sunflowers are for you! This is a pastel and gouache sketch in a 12 X 12 Derwent sketchbook with black paper. This entry was posted in Telling a Story and tagged Floweres, Gouache, In- the- moment, Line, Still Life. Bookmark the permalink.